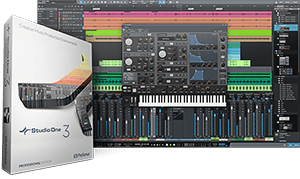 Software – Modular Display Inc.
PreSonus® offers a variety of powerful, yet easy-to use recording, control, and music-notation apps for Mac®, Windows®, iOS®, and Android™. Our award-winning, tightly integrated software enables you to record live and in the studio with incredible ease and speed; compose quickly and play your scores with superb sounds; control StudioLive® mixers, StudioLive AI loudspeakers, and Studio 192-series and Quantum-series interfaces; completely automate virtual soundchecks; save mixer scenes with your live recordings and edit both; and much more. PreSonus hardware and software work together to form a cohesive ecosystem that helps you achieve your creative vision.